Palestinian Authority President Mahmoud Abbas slams Prime Minister Benjamin Netanyahu’s comments regarding the Nazi final solution, and says Netanyahu tried in his address to change history. “He made Hitler innocent and tried to make al-Husseini guilty for the horrible crime against the Jews,” Abbas said, according to a report on the Hebrew-language website Walla. “In order to hit against us and our position he changes the history of the Jews in a despicable way,” Abbas said. Netanyahu came under fire from the opposition, Holocaust scholars and others for saying during a speech at the World Zionist Congress in Jerusalem yesterday that German dictator Adolf Hitler did not seek to annihilate the Jews but was content to have them evicted from Europe. Netanyahu said Hajj Amin al-Husseini, who was the grand mufti of Jerusalem during World War II and an ally of the Nazis, was the person to suggest to Hitler that to solve the so-called “Jewish problem” Hitler would need not to expel the Jews but to kill them. 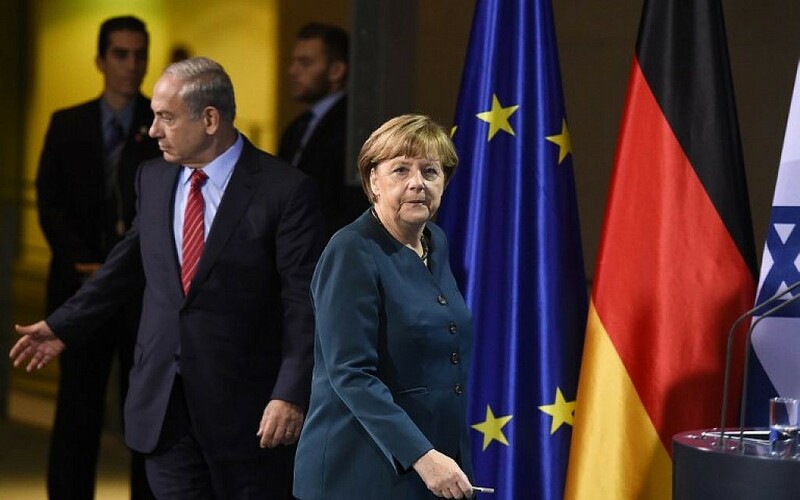 Netanyahu today said – ahead of a state visit to Berlin – that in his speech at the World Zionist Congress in Jerusalem he did not mean to exempt Nazi dictator Adolf Hitler from his “diabolical responsibility” for the Holocaust of the Jews of Europe. 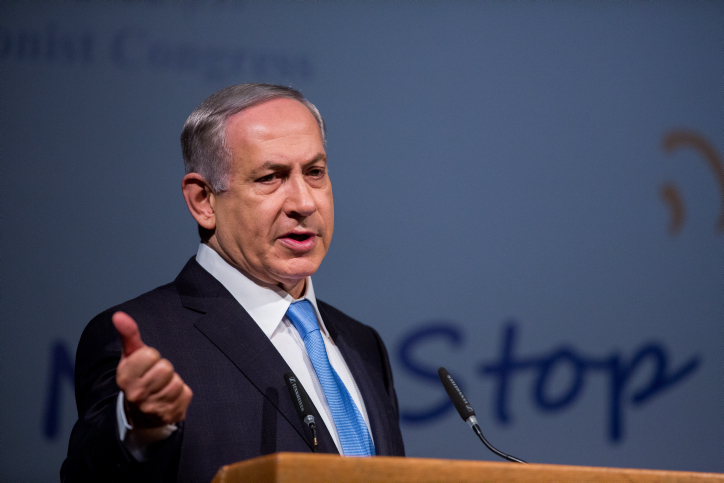 “He is responsible for the final solution, and he made that decision,” Netanyahu clarified. “It is also absurd to ignore the role filled by Hajj Amin al Husseini, who was a war criminal and encouraged Hitler to destroy the Jews of Europe,” he says. The prime minister says he wanted to stress the mufti’s involvement in the Final Solution, the Nazi program to exterminate European Jewry. In his speech he read quotes from one of the associates of Adolf Eichmann, who said at the Nurenberg Trials that the mufti filled an important part in the Final Solution and was one of the initiators of the systematic genocide against European Jews. Some academics, he says, try to provide apologetic excuses for the role the mufti filled during the Holocaust. “I did not want to absolve Hitler of responsibility but only to show that the father of the Palestinian nation [sic] wanted to exterminate Jews even without issues of territories, occupation or settlements,” Netanyahu says. 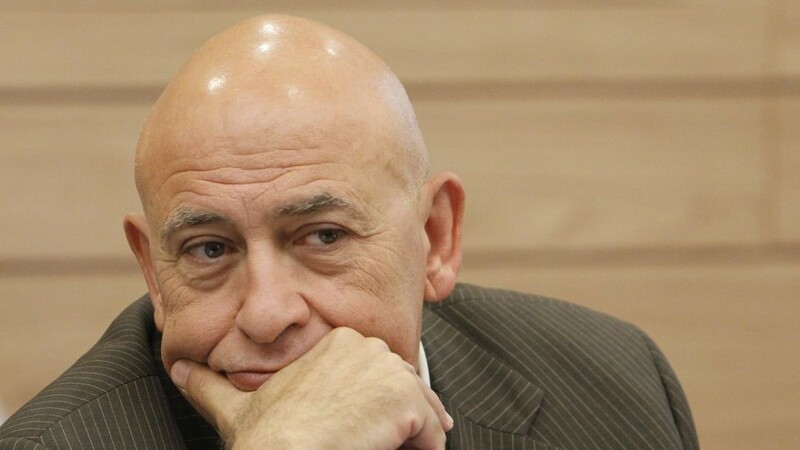 He refers to the party’s decision to vote against a bill he submitted that would create an official state memorial for the victims of the Kafr Kassem massacre. “In days like these, they vote against a proposal so important for promoting understanding and recognition of the suffering and [historical] memory of the other,” says Freij. The event he refers to took place on May 29, 1956, when a Border Police unit shot and killed 43 residents of Kafr Kassem, including women and children. Other people were shot outside the village and one elderly man died from a stroke when he learned that his son was killed. 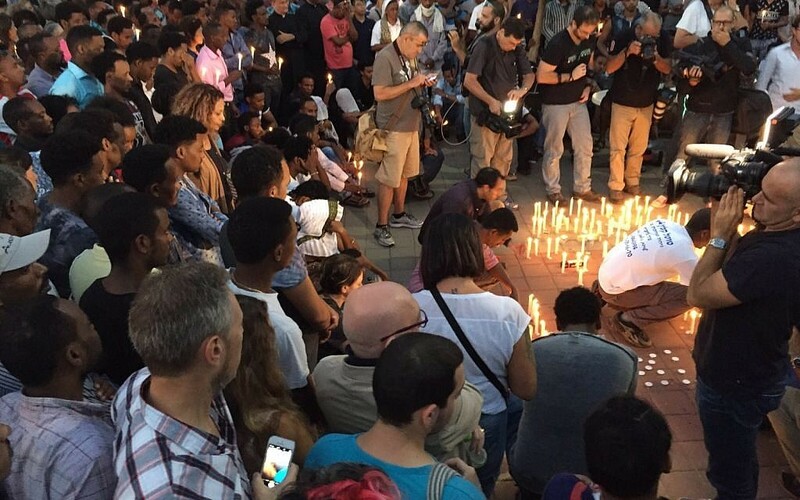 The total death toll was 49 people. 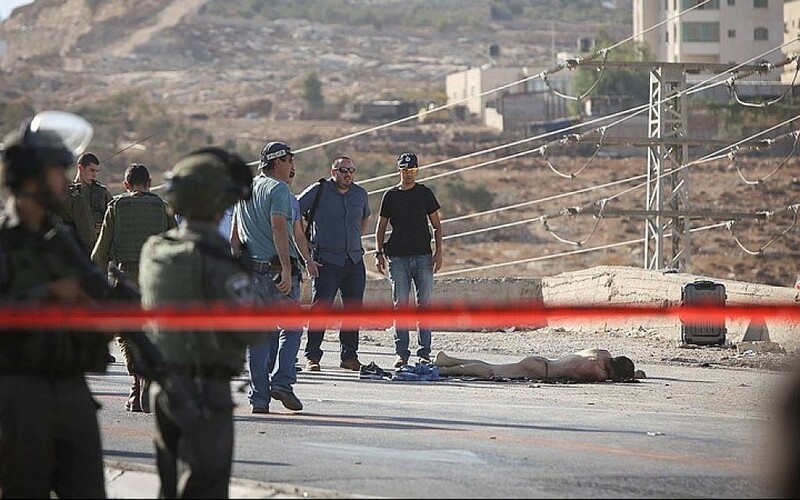 The incident occurred when one of the Border Police commanders, Shmuel Malinki, interpreted his orders regarding a curfew then in place on several Arab villages, that said “God have mercy” on those who broke curfew, to mean they should be killed. The Israeli government at the time immediately made efforts to cover up the incident, one of the most disgraceful events in the early history of the Jewish state. Eventually, 11 officers and soldiers served long prison sentences for the crime. The Kafr Kassem massacre was a watershed event in the creation of the IDF’s ethical code. Today a stone memorial in the village marks the event and is inscribed with the names of the victims. Palestinians hurled rocks at homes near the Shavei Hebron yeshiva in the West Bank city, Ynet reports. UN chief Ban Ki-moon urges an end to spiraling violence as he meets PA President Abbas in a bid to calm three weeks of deadly unrest. “We will continue to support all efforts to create the conditions to make meaningful negotiations possible,” Ban tells journalists after meeting Abbas in the West Bank city of Ramallah. The Kurds in Syria declare independent rule in a new province bordering with Turkey, according to a report in Reuters. Kurdish authorities in the country captured the border town of Tel Abyad in June from Islamic State, under the cover of US airstrikes. The new administrative province “has been officially announced as a canton,” said Delil Osman, a media official in the Kurdish-led administration. An Israeli soldier was lightly wounded a few minutes ago when she was stabbed near the Adam junction, north of Jerusalem near Hizmeh. The terrorist who stabbed her was shot and killed. At 14:55 Magen David Adom paramedics received reports on a female soldier stabbed in her upper body. They arrived on the scene and are treating the 19-year-old soldier, who is conscious. Paramedics at the scene assess her as being in serious condition and are evacuating her to Hadassah Hospital in Jerusalem. Apart from the terrorist killed while stabbing a soldier in the Adam junction north of Jerusalem, another suspect has been arrested. Sappers at the scene are checking whether a bag carried by the stabber was booby-trapped, in what may indicate an attempt to detonate a bomb in a public place or a planned suicide attack. “A young female, about 19, was lying on the gravel by the road, stabbed in her upper body. People nearby were giving her initial treatment, with guidance by phone from the Magen David Adom hotline. A female combat soldier from the Home Front Command shot and killed the attacker who stabbed another soldier at the Adam junction, Ynet reports. Hamas: Ki-Moon's remarks are prejudiced, favor the Israeli occupation and equate murderer settlers with Palestinians who defend themselves. The female stabbed at the Adam junction is in critical condition, according to several reports. She was earlier evacuated to Hadassah Mount Scopus hospital in moderate to serious condition. She is unconscious, according to a report on Channel 10. The bill, submitted by Yoel Hasson, an MK in Labor, one of the two parties comprising Zionist Union, calls on the government to adopt the recognition of a future Palestinian state alongside the Jewish State, the central point of a landmark speech made by Netanyahu in June 2009. At the time the speech was seen to mark a softening of Netanyahu’s position on the idea of Palestinian statehood. Zionist Union says that “the fact that Likud MKs and Netanyahu’s natural partners voted against the comments by the prime minister and chairman of Likud himself” shows that the prime minister has lost his capability to control members of his own coalition. “They were joined by Meretz voters who chose not to support a diplomatic solution that will bring a separation from the Palestinians,” the statement continues, adding that Netanyahu reiterated his commitment to a two-state solution only recently at the UN. The Nazareth District Court sentence Mahran Khaldi, 20, to 3.5 years in prison for joining a terror organization. Khaldi left Israel for Turkey, then to Syria. He trained and fought among the ranks of Islamic State and was wounded in a bombing. President Reuven Rivlin weighs in on the Hitler-mufti comment, which has been dominating Israeli media today ad nauseum. Rivlin says there was “no one like Hitler” for tragedy in the whole world, and for Jews in particular. Historians and opposition MKs are having a field day with Netanyahu’s comment. Netanyahu has since clarified his comment to indicate that he did not mean to “absolve Hitler” but to demonstrate that the Palestinians’ hatred of Jews – dating back to pre-state days – has nothing to do with settlements, or what the Palestinians call the occupation of areas they claim for a land. In a somewhat ironic turn of events the prime minister is in hot water for the Hitler-mufti comments just on the day he heads to Germany for an official visit. The comment by the prime minister dominated Israeli media intensely today. It rippled abroad as well, with the Germans even issuing a statement saying they bore responsibility for the Holocaust. Police say they have arrested a suspect in a hit-and-run incident suspected of being a terror attack at a checkpoint in the West Bank earlier today. In a tweet, the police say they transferred the suspect for questioning. An Israeli policeman was mildly injured in the car-ramming attack next to the West Bank settlement of Ofra, north of Jerusalem. The driver crashed into the checkpoint after ignoring police warnings to stop. Security forces reportedly opened fire on the vehicle as it approached the barrier, according to the Channel 10 news. The driver was not apprehended and managed to flee the scene to the nearby village of Silwad. The Palestinian who stabbed a female soldier today and was shot and killed by another soldier was named by Palestinian media sources as Muataz Atallah Qassem, 22, from Eizariya, near Abu Dis in East Jerusalem. Jerusalem City Hall approved Wednesday 100 housing units in East Jerusalem, for Arab residents, Army Radio reports. The municipal planning and construction committee decided to approve the project near the Arab neighborhood of Beit Safafa, in southern Jerusalem. Unnamed city hall officials lambasted the decision, saying the approval of Arab housing in East Jerusalem was tantamount to “a prize for terrorism,” Army Radio reports. Chief Palestinian negotiator Saeb Erekat, as per a tweet by journalist Khaled Abu Toameh, says Palestinians fought along the allied forces in World War II. His remarks follow a statement by Prime Minister Netanyahu yesterday where he made inaccurate remarks about ties between the Arabs of British-mandate Palestine and the Nazi regime, which have been well documented. Saeb Erekat: "Palestinian efforts against Nazi regime are a deep-rooted part of our history. Palestinians fought alongside Allied Troops." The female soldier stabbed this afternoon in Adam junction north of Jerusalem is in stable condition, says a doctor at Hadassah Mount Scopus Hospital, where she arrived in critical condition. He tells Channel 2 the stabber damaged multiple blood vessels in her neck and there is risk that the blood flow to her brain will be impaired. The soldier is being transferred to Hadassah Ein Kerem Hospital, where she will undergo further tests and receive continued treatment. 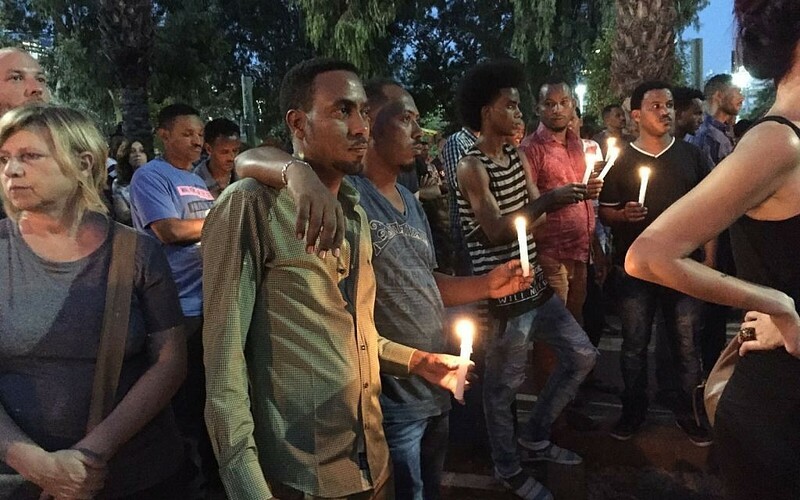 Hundreds of people are at Lewinsky Park in southern Tel Aviv, a main meeting place for African migrants, for a memorial ceremony for Haftom Zarhum, the Eritrean man who was killed by a mob at the Beersheba central bus station on Sunday when he was mistaken for a terrorist. A coroner says Zarhum died from a bullet wound and not from the beating he suffered. Defense Minister Moshe Ya’alon said yesterday the people who ganged up on him shout be tried for their actions. Some 20 Palestinians are hurling rocks and trying to damage the Gaza Strip border fence, near the El Bureij refugee camp. IDF troops are repelling the Palestinians with tear gas. According to the Hebrew website Ynet, one man was shot in his lower body. His condition is as yet unknown. Rocket sirens sounding off in the western Negev, in Kfar Aza and Sa’ad. Israel “totally rejects” the shameful resolution on ‘Occupied Palestine’ adopted today at the plenary of the 197th Session of UNESCO’s Executive Board, the Foreign Ministry says in a statement. The decision is “yet another step” in the Palestinians’ “continuous endeavor to rewrite history and distort the sources of World Heritage in this part of the World. The Palestinian leadership’s attempt to claim for themselves Jewish and Christian Holy Sites doesn’t bode well; suffice to look at the torching of Joseph’s Tomb by Palestinians just a few days ago. The deep Jewish ties to the holy sites in Jerusalem and its surroundings are undeniable and no decision of UNESCO can alter that,” the statement concludes. A rocket fired from the Gaza Strip landed in an open field in the western Negev, according to a report on Channel 2. There were no casualties or damage. At least 13 people including hospital staff were killed when Russian warplanes struck a field hospital in northwestern Syria, the Syrian Observatory for Human Rights says this evening. “Thirteen people were killed in Russian air strikes on Tuesday on a field clinic in the town of Sarmin, including a physiotherapist, a guard and civil defense member,” the Observatory’s Rami Abdel Rahman tells AFP. Sarmin lies in the northwestern province of Idlib, which has been regularly targeted by Russia’s military since the beginning of its air war in Syria on September 30. US Vice President Joe Biden announces he will not seek the Democratic nomination for president. He vows to make his voice heard when the time comes, and says the Democratic party’s next candidate should build on US President Barack Obama’s achievements. A Molotov cocktail was hurled at a bus not far from Halhul, a Palestinian village in the West Bank. It detonated and damaged the bus. No casualties were reported. A car has collided with two other vehicles in Jerusalem, leading to fears the incident may have been a terror attack. Two people are being treated for light injuries at the scene on Hativat Harel Street, near the French Hill neighborhood of East Jerusalem. The driver of the car has fled the scene on foot, according to initial reports. There are also unconfirmed reports of shooting at the scene. Officials say they are investigating the cause of the crash. 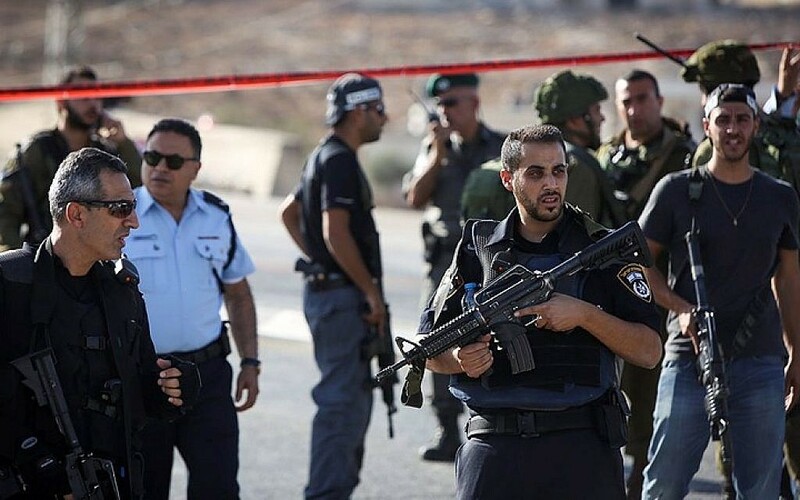 Two Palestinians are arrested at the entrance to Ma’ale Adumim, a West Bank settlement, for possession of two improvised explosive devices found in their car. Police sappers are on their way to the scene. The suspects have been taken for interrogation. The Prime Minister’s Office is denying a report that Israel proposed to limit the number of Jews and non-Muslims entering the Temple Mount in an effort to calm tensions. Read about the proposal here. An initial police investigation shows the incident this evening in Jerusalem was not a car-ramming terror attack but a hit-and-run accident. Traffic police officers sought to check the details of a driver, who escaped in his car and hit two pedestrians. The driver then exited the car and tried escaping on foot. Police officers chased him and succeeded in arresting him, Ynet reports. German Chancellor Angela Merkel repeats Germany’s responsibility for the Holocaust, hours after a government spokesman said Germany was behind the Holocaust and there was “no reason” to debate the issue. At a press conference with Merkel, Netanyahu repeats comments he made before flying to Germany, quoting testimony by one of the assistants of Nazi war criminal Adolf Eichmann who mentioned Hajj Amin al-Husseini. He then says the real question should be directed at Abbas: Why are the Palestinians officially praising Husseini as a national hero? 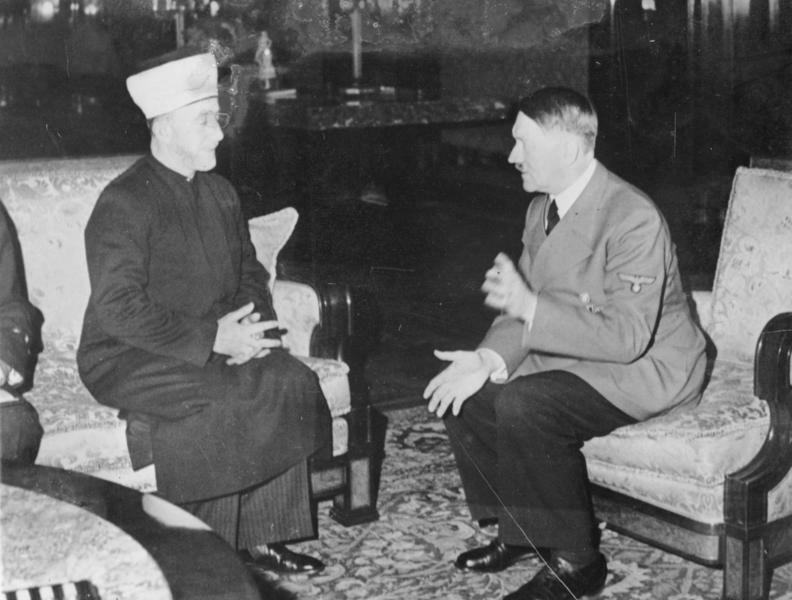 Husseini met with Hitler and supported the German genocide against the Jews. Russian President Vladimir Putin telephones his Egyptian counterpart and the king of Jordan, updating them on details of his meeting with Assad, which took part yesterday and today. The Kremlin issues a statement that says Putin told Assad that military force alone will not suffice to combat terror in Syria. Initial reports of another car-ramming attack in the West Bank, on Road 60 near Beit Ummar. Reports say five soldiers have been injured. An Israeli car driving on Road 60 came under a hail of rocks thrown by Palestinians and its passengers were targeted by a car as they exited the vehicle, according to Channel 2. On person is in moderate to serious condition and three others are in light condition. 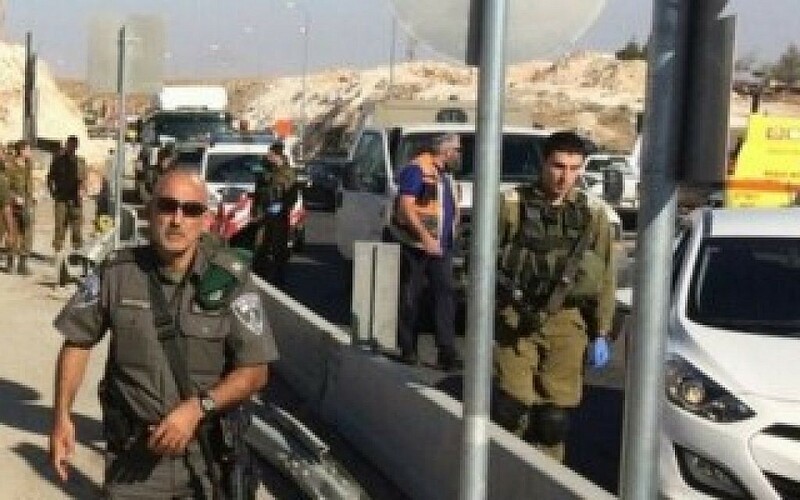 IDF soldiers fired at the Palestinian driver who was badly wounded, reports say. Hebrew paper Ma’ariv reports that Palestinians near Beit Ummar are hurling rocks at emergency workers in an effort to prevent them from tending to the wounded. The Palestinian terrorist who drove his car into the Israeli passengers after they exited their vehicle was shot dead by soldiers at the site, police say. Magen David Adom paramedics say they are treating four people after a car-ramming attack on Road 60. One is reportedly to be in serious condition with a head injury, and is being driven by ambulance to Hadassah Ein Kerem Hospital. Three others are lightly wounded and being treated at the scene. 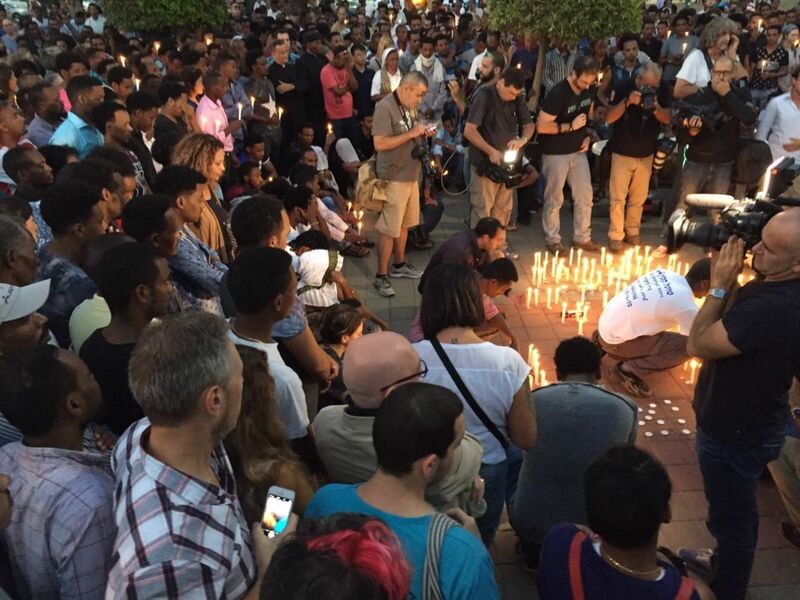 Four people are arrested for what is being described as a lynch attempt against an Eritrean man killed in Beersheba’s terror attack on Sunday. Among the four detainees are two employees of the Israel Prison Service, one of them a warden. The terrorist who rammed into four Israelis, wounding one seriously and three lightly, is being taken to Shaare Zedek Hospital in Jerusalem. He was shot as he carried out the attack and is in serious condition.